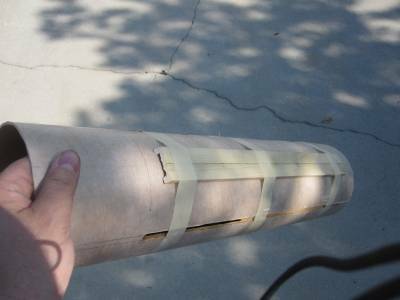 I've had good success just drilling a hole in a body tube, placing a drop of CA in the hole, then screwing a rail button onto the side of the rocket. I've also used well nuts successfully. Drill a larger hole for the well nut. Insert the well nut in the hole. Then screw in the rail button. The well nut expands to seal itself in the hole. The above methods are simple and have been reliable in my smaller rockets. As my rockets have gotten larger, however, I've considered ways to ensure that the rail buttons are attached more accurately and more securely. I came up with a simple solution that works even if you are adding rail buttons to an existing rocket. 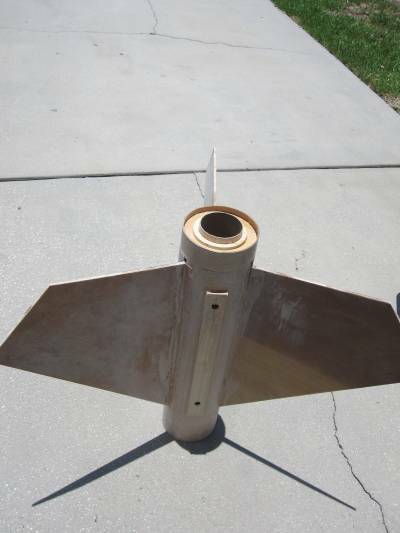 I attach a piece of wood to the outside of the rocket then use a well nut to secure the rail button to both the body tube and the piece of wood. This ensures that the rail button is more firmly attached to the body tube. To ensure that the rail buttons are more accurately aligned, the piece of wood is long enough that both rail buttons attach to it. 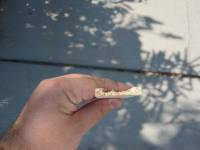 And, I shape the piece of wood so that, when laid flat against the curve of the body tube, it is forced to align straight along the tube. 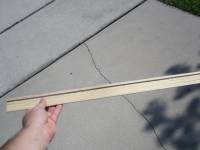 As you can see in the photos, I use a router to carve the wood strip into a channel shape. 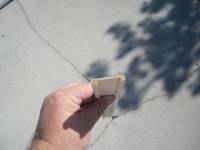 You could also create the shape by gluing thin strips of wood along each edge of a thinner strip of wood. When you attach the wood to the body tube (I used epoxy adhesive), the squared-off U shape of the wood causes it to stay straight. Before attaching the wood, I drew a line down its center. After attaching the wood to the body tube, I drilled proper-size holes for the rail buttons. A filler is used to add fillets on each side of the wooden rail and to fill in the openings at the top and bottom. After painting, well nuts are inserted into the holes then the rail buttons are screwed into place. The wooden rails ensure that the rail buttons are attached firmly to the rocket, are directly aligned with each other and with the rocket body, and stick out straight from the body.